I had been to Thailand years before on holiday, had seen the distinctive fishing boats from white sand beaches. My last two trips to Thailand with EJF were very different. Though they have taken me to the same islands I visited as a tourist, this time it was to investigate illegal fishing, human trafficking and slavery in the Thai fishing industry. As part of our most recent investigation, the team was hoping to document Thai vessels transshipping at sea. This practice sees fishing boats unloading their catches to motherships, allowing illegally caught fish to be mixed with legitimate catches. It also prevents trafficked, slave workers from returning to shore where they have a better chance of escape. We understood that the transshipment site was located between a group of largely uninhabited islands in the Andaman Sea, around 30 nautical miles from the mainland. It was sheltered and isolated, allowing vessels to dock with one another safely and discreetly. As the sun fell, lights began to appear as the fishing boats slowly converged on one of the larger mothership vessels. The transshipment process continued through the night as boat after boat unloaded barrels of fish. Posing as tourists, we were able to film and photograph the transshipment from a chartered vessel, at times close enough to smell the cigarette smoke from the crews as they worked. Well established as it is, the transshipment site supports a basic infrastructure of shop-boats where fishing vessel crews spend what little money they have on energy drinks and food. The morning after the first transshipment, we pulled alongside a shop-boat as it was docked with a fishing vessel. Through a translator, we were able to speak with Oo-Soe (name changed), a Burmese migrant who worked aboard the fishing vessel and had been trafficked into Thailand and forced to work. He had been on board for five years without pay. Oo-Soe pleaded with us to rescue him. For his safety and ours, we were not able to take him on board. Where he is now, whether he is safe, whether he is still at sea, I don’t know. 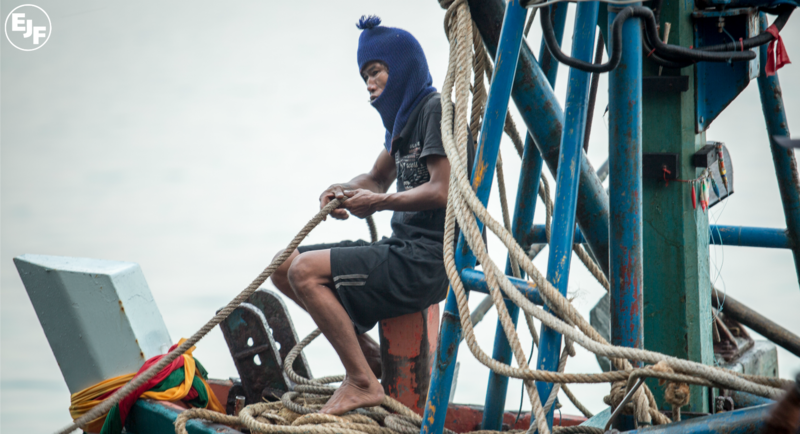 Oo-Soe is one of thousands of men trafficked into slavery aboard Thai fishing vessels every year. The fishing industry in Thailand is worth billions of dollars annually – it’s a business that’s making some people very rich while completely destroying the lives of others. Watch our latest film & read the new report.